My only serious criticism of Kid Gloves is that it uses flip screens. That apart, Kid Gloves is a sharply put together game. The slick action and the spook screens make it a bit of a winner. Kid Gloves may not be one of the largest platform games around but it's one of the most amusing. Go a few rounds with it. 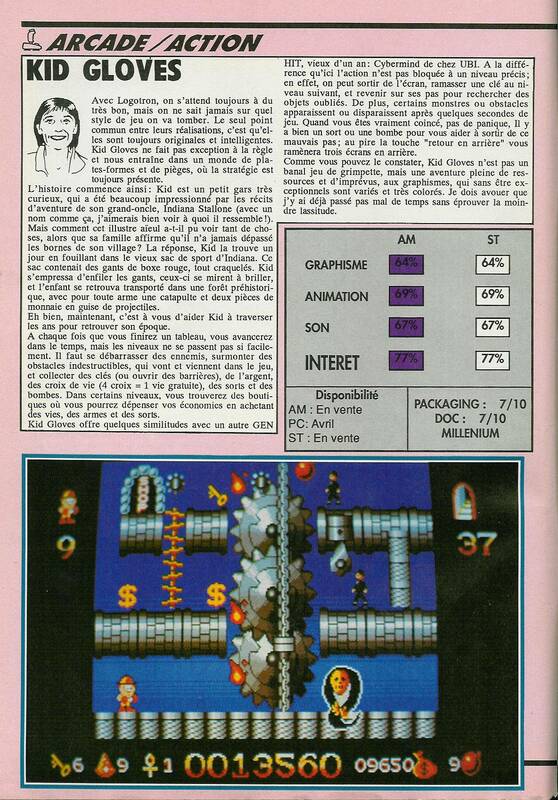 Comme vous pouvez le constater, Kid Gloves n'est pas un banal jeu de grimpette, mais une aventure pleine de ressources et d'imprévus, aux graphismes, qui sans exceptionnels sont variés et très colorés. Je dois avouer que j'y ai déjà passé pas mal de temps sans éprouver la moindre lassitude. Kid Gloves has no more to offer than any other platform game, but it's still good fun. The presentation, apart from a strange shadow effect, is pretty minimal, and the collision detection is highly dodgy making gameplay frustrating at times - but it doesn't stop you wanting to have one more go. Twin World and Rick Dangerous are better examples of this type of game, but if you're tired of those two, this is a challenging alternative. I was pleasantly surprised at the quality of the game's design and it's graphics. Joystick control is easy. What more can I say! For a budget game this is definitely worth the money, get your hands on it and start jumping and blasting away. Obwohl "Kid Gloves" eine ganze Menge Extras und Zaubersprüche mehr bietet als "Rick Dangerous", erreicht es nicht dessen Klasse. Kleinigkeiten sind entscheidend; allen voran die wenig durchdachten Puzzles und die pingelige Kollisionsabfrage, die mächtigt nervt. Kid Gloves ist ein amüsantes Hüpf- und Laufspielchen. Sound und Grafik sind zwar nur durchschnittlich, dafür bietet das Game ordentlichen Spielspaß – dem Spieler wird nicht nur Geschick, sondern auch einiges an Strategie abverlangt. Positiv fiel außerdem die abwechslungsreiche Gestaltung der einzelnen Level auf: Alle zehn Bilder (insgesamt 50) wechselt die Zeitepoche. Wenn es also auch kein Hit unter den Jump-Games ist, besser gelungen als z.B. "Axel’s Magic Hammer" ist Kid Gloves nach meiner Meinung allemal. Nowadays, a game set in a familiar mould must try to include that extra spark that pushes it ahead of all the others in the genre. Despite a humorous plot and an attempt to create a cute ‘small boy’ hero for players to identify with, Kid Gloves is just a basic ‘progress from screen to screen’ platform game like so many seen in the past. The sound and graphics are acceptable without being special, the gameplay overly simple and the addiction short lived. Even those new to computing and not old enough to remember the original Manic Miner can see the Amiga version to realise how much the format has aged, and sadly Kid Gloves just follows the tradition without providing much interest to leave its mark on the History Book of Software. Huge amounts of fun, but no brain strain. Play it after Klax to relax yourself.